Shopify has two methods for handling shipping costs for your customers: price based and weight based. When Inkthreadable ships a parcel we use weight based shipping, so to set up your Shopify shipping rates to match ours you'll need to use the same method. This means you can't use the price based option, so offering promotions like 'free shipping for orders over £30' isn't possible. On the flip-side, by following our guide you'll be able to set up your rates to match ours as closely as possible, and you'll be able to offer the cheapest shipping rates for all orders as a result! Our shipping rates are also based on destinations, so you could use the weight based shipping rates to offer free shipping with a particular service to the UK, for example you could use the Royal Mail 48 service since it's the cheapest. 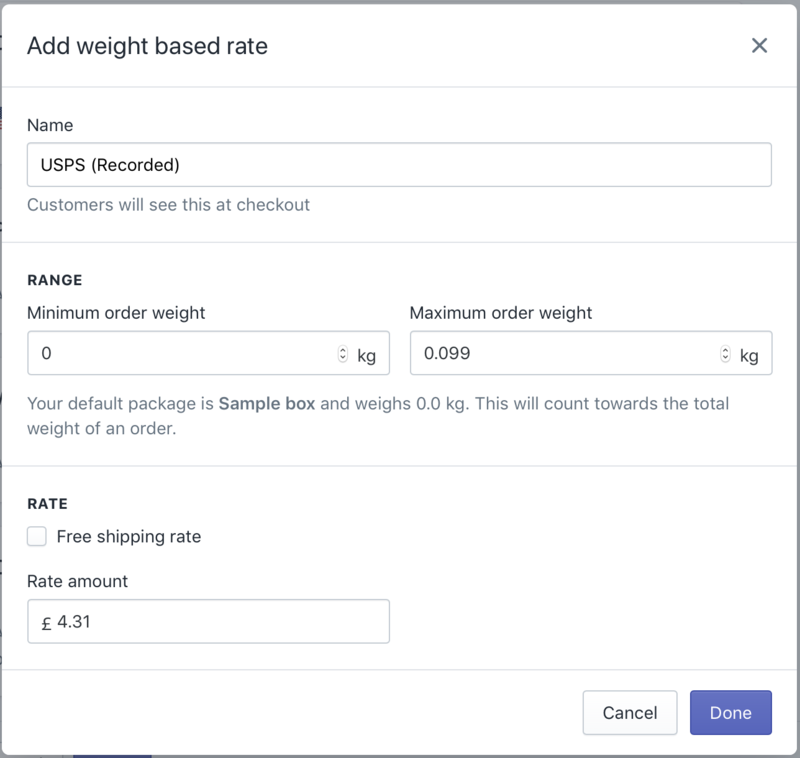 Since we're using weight based shipping, you'll need to make sure your products have weight values assigned to them. If you're just getting started and don't yet have any products listed in your Shopify store you can ignore this step, though it may be useful to know the method if you're planning on creating any products manually. 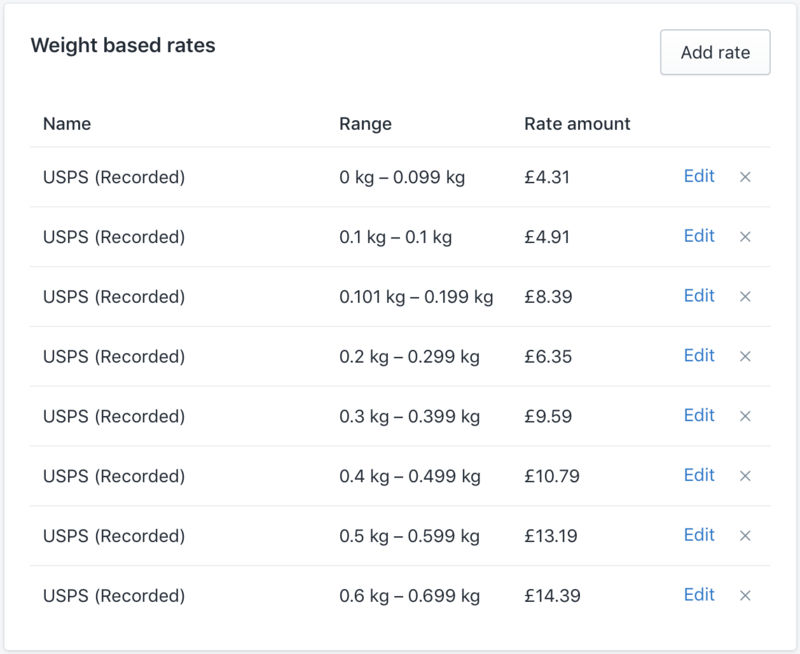 Any products exported from Inkthreadable to Shopify will have weight values assigned to them, so if that's how you'll be working then you won't need to worry about this step at all! Editing each product manually would be pretty time consuming, but Shopify has a handy tool to help with that - the Bulk Editor. To use this tool, navigate to your dashboard and click Products then Export. You’ll be given an option to use the bulk editor. If the weight field isn’t shown by default, click Add more fields and choose Weight. Starting with your first product, click the cell at the top of the weight column. Hold shift and click the bottom one. This will highlight the weight for each variant of the product. When you type it'll input into each cell simultaneously. Make sure you change the weight to grams (g). The weight of a sweatshirt is 200g, so this is the value we've assigned to the Ink Logo Sweatshirt variants. Most products will either be 100g or 200g but there are a couple of exceptions. It's worth noting that these weights aren't accurate, they're approximations and it's more the value itself we're interested in. Each weight has a value assigned to it depending on which zone the parcel is being shipped to. These values will be totalled for each item in the parcel and the shipping cost calculated for the order. Working this way you'll never pay too much or too little for shipping, and you can match the rates with our own rates to keep shipping costs for your customers as low as possible too. 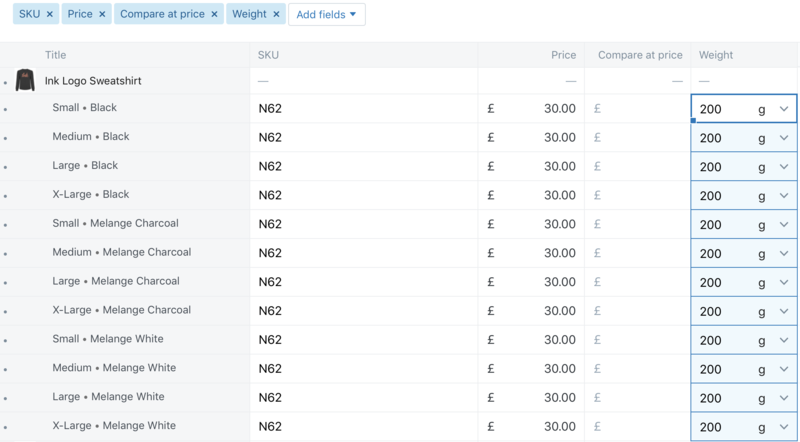 Use the bulk editor to assign the appropriate weight value in the table above to each of your products in turn. You'll only need to do this once so it's worth taking the time to get it right. Once you've assigned weights to each of your products we can move on to the setting up your shipping rates. Before we get started it's worth mentioning that your shipping rates don't need to match ours. We simply pass on the cost of shipping to you, and to keep this cost as low as possible we don't take any profit ourselves from shipping your parcels. You can charge your customers less to offer them cheaper shipping, more to increase your profit or nothing at all if you want to offer free shipping. In each case, we'll still charge the rates listed on our site which are identical to the rates shown in the tables below. To get started, head back to your Shopify dashboard, then click Settings > General. We're going to set the units of weight to Kilogrammes (since this is the unit we've used to assign weights to our products). Scroll down to the Standards and formats section at the bottom of your General settings page and change the Unit System to Metric System and the Default weight unit to Kilogrammes (kg). Changing these settings changes the default weights used for calculating shipping. Skipping this step will leave your shipping being calculated using the Imperial unit Pounds (lb) instead of the Metric unit Kilogrammes (kg), so make sure this is done! Still under your dashboard Settings, head to the Shipping tab. Scroll down a little to the Zones and rates heading. By default, we already have two zones set up (yours may be slightly different). Inkthreadable are based in the UK so the first zone we're going to set up will be for orders shipped to the UK only. This will be the same for you regardless of where your store is based - all orders fulfilled by us will be shipped from the UK. Since one of these zones already has the UK assigned to it we won't be able to set up a new zone with the UK included so we're going to begin by editing the Domestic zone. Click Edit. Tip: Your domestic shipping zone might be a different country entirely depending on where you are. If the UK isn't listed as your domestic shipping zone then click Edit as above and add the United Kingdom to the list of countries for this new zone. Delete any other country in this list. Both of the options already listed here need editing or deleting since they're wrong. Start by clicking Edit next to Standard Shipping. We'll be adding every single shipping method offered by Inkthreadable in this guide, but you don't need to. If you'd prefer to only offer Royal Mail 48 to the UK for example, this isn't a problem. You can follow the steps in this guide to offer the services you want to use, and ignore the rest. Let's get started with the cheapest UK shipping method, Royal Mail 48. 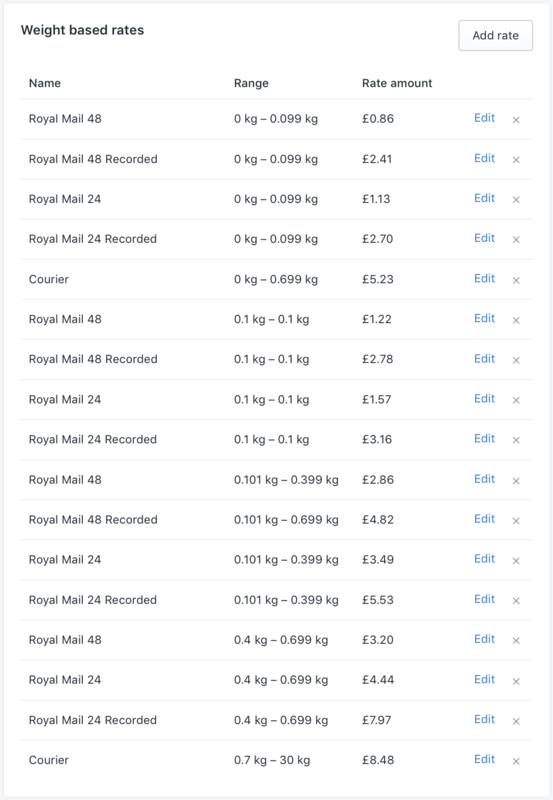 Change the Name to Royal Mail 48, the Minimum order weight to 0 kg, the Maximum order weight to 0.099 kg and finally the Rate amount to £0.86. Click Done. We've just set up our first shipping rate! Now any orders of up to 0.099 kg being shipped to the UK will automatically have the shipping rate calculated at £0.86 when the Royal Mail 48 option is selected at checkout. The next step is to set up each individual rate based on weight and destination. The tables below list the rates for Royal Mail 48 & 48 Recorded, Royal Mail 24 & 24 Recorded, and DPD based on weights to the UK, Europe and the rest of the world. When using this system it’s important to make sure your shipping rates include the correct keywords for each shipping method. Our system looks for these when an order is received from your Shopify store so to avoid mistakes we always advise these keywords be used for each shipping method. Using these keywords is as simple as including them in the Name field for each shipping rate you set up. Continuing on from the first rate added, use the same method to add the rates listed below. You'll notice that there's a Courier option that's actually cheaper than some Regular and Recorded shipping options - this isn't a mistake. Our Courier service can ship parcels at 699g or lighter for £5.23. This is a fully tracked, next day shipping service available for orders shipped to the UK only. 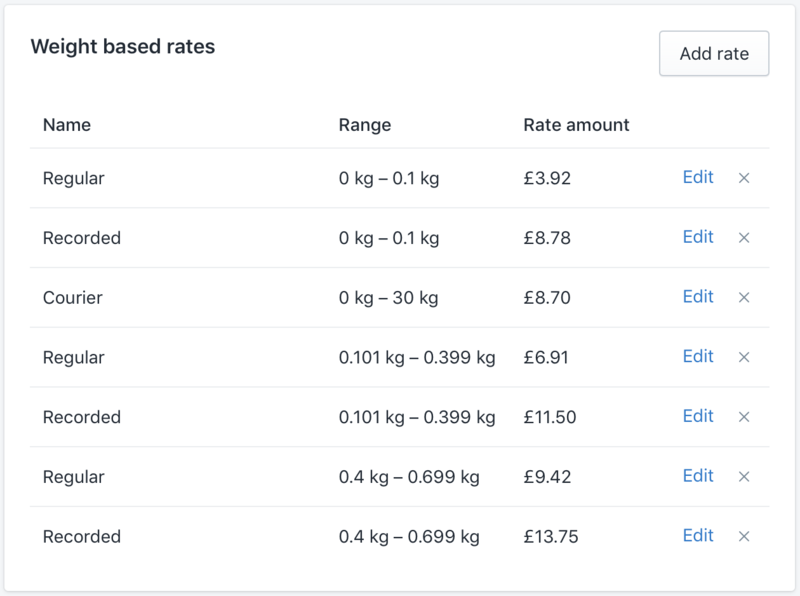 This is obviously quite a long list, and Shopify automatically orders each rate based on the weight range, so it might be quicker to use this as a guide but create each method in turn. Start with Royal Mail 48 & 48 Recorded and work your way through, copying and pasting the names as you go so you don't have to keep typing them. When you're finished your list will look like ours. When you're finished click Save and return to the Shipping tab in your settings. You'll need to add new zones to your Shopify shipping profile to allow for tiered prices for parcels shipped by Courier to Europe. This is going to involve creating 5 new shipping zones. 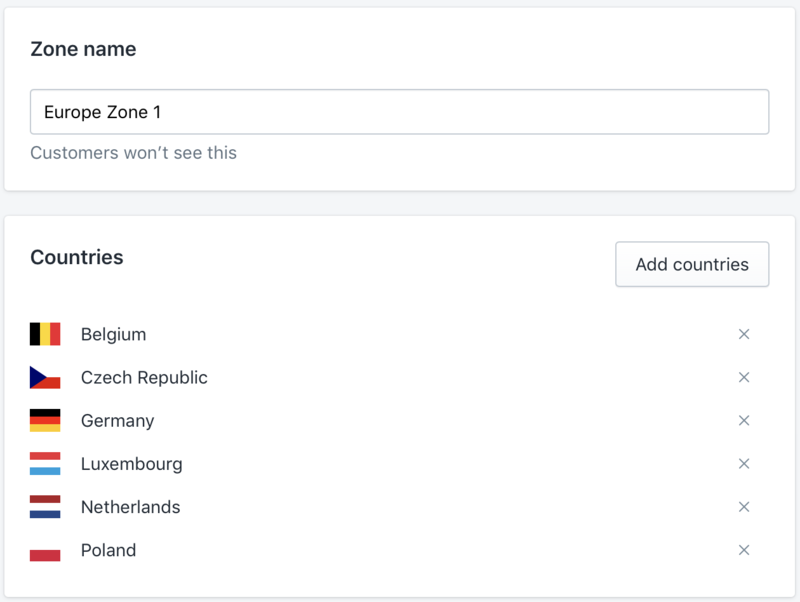 The way Shopify's system works means you'll need to break up countries into zones and add all available shipping rates for each zone, despite all but the courier rates being identical for each European country. It sounds more complicated than it is, so don't worry! Under Zones and rates click Add shipping zone. Name this zone something like 'Europe Zone 1' to make it easy to identify. The countries you'll be adding to these zones are detailed on our Shipping Costs page, so for this zone we're adding Poland, Germany, Czech Republic, Netherlands, Belgium & Luxembourg. 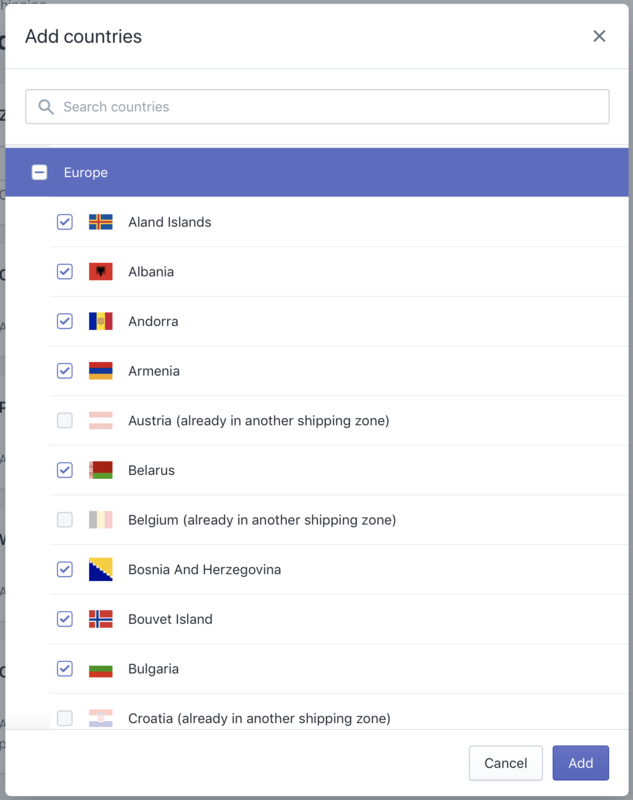 Use the search box to locate these countries, and add each to the shipping zone by checking the box next to each one in turn. The courier rate of £8.70 for zone 1 has been taken from our zone table on our Shipping Costs page. You find all rates listed here for each zone, with Zone 5 being the rate for any country not listed in Zones 1 - 4. Click Save before leaving this page! Create a new rate and name it according to the zone you're creating. Add each country in the zone you're creating. Add the weight based rates for Regular & Recorded shipping. Add the Courier rate based on the cost listed in the zone table. Zone 5 will include all countries in Europe that haven't yet been accounted for. The process for setting it up is the same as above, but rather than adding individual countries you can select an option to add all European countries that haven't been added to another zone. Make sure you create this zone last, otherwise you'll need to delete it to create the other zones. Create the new zone as above and name it 'Europe Zone 5'. When you click the Add countries button, scroll down a little to find the check box next to Europe. Check this box and you'll see all countries but those previously added to other zones selected. Now you can set up your weight based rates as above, and use the Zone 5 courier cost of £22.75 to decide what to charge your customers. Next, we're going to create a zone for the US. We're singling this country out from the rest of the world since we offer a cheaper option than Royal Mail for shipping parcels there, which uses the USPS recorded service. Head back to your Shipping settings and click the Add shipping zone button. You'll create a zone that only includes the US, and create weight based rates within this zone. Name the zone 'US' or something similar to help you identify it, and then add United States under Countries. Since the new US rate replaces the old Royal Mail services, there will only be two services we need to add for shipping to the US: the USPS service, and the Courier service. Scroll down to the Weight based rates and click Add rate. 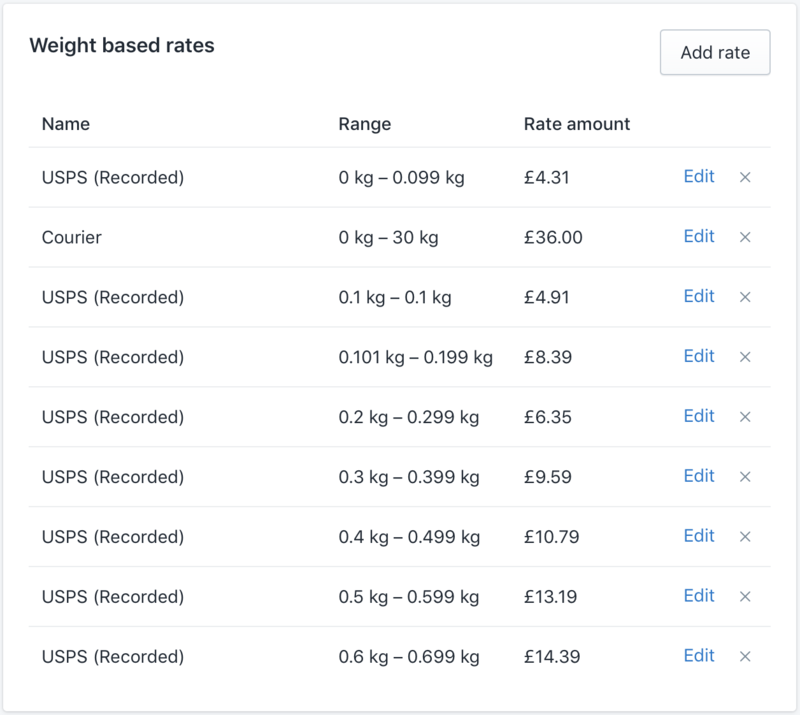 The keyword our system will look out for for the new rate is USPS, so enter USPS (Recorded) in the Name field, with a minimum and maximum weight of 0.00 kg and 0.099 kg respectively. We've used Inkthreadable's cost of £4.31 for this weight, so refer to our Shipping Costs page to determine your own costs for this. You might have noticed the rate for 0.101 - 0.199 kg is higher than for those following it. This isn't a mistake. We've made the rates as cheap as possible, but each weight bracket cost is based on both weight and parcel size. The vast majority of parcels shipped in the 0.101 - 0.199 kg are mugs, which are much heavier than t-shirts. Based on the minimum and maximum weight of this bracket there are only two product combinations this will be used for: a single mug, or a t-shirt shipping with a lightweight accessory (socks, phone cases and morfs). Two t-shirts will hit the 0.200 - 0.299 kg weight bracket, so they'll ship at a cheaper rate. Once you've finished with the USPS rates, the final step here is to add the Courier rate. Click the Add rate button. Name this rate 'Courier', and the weight range should be 0 - 30 kg. The courier rate to the USA is the same as for any country outside of Europe, £36.00, so this is the rate we've used. Click Done. That's your USA rates completed! Remember to click Save before leaving this page or you'll need to do it all again! And that's it! You've now created rates for all services shipping to all destinations. 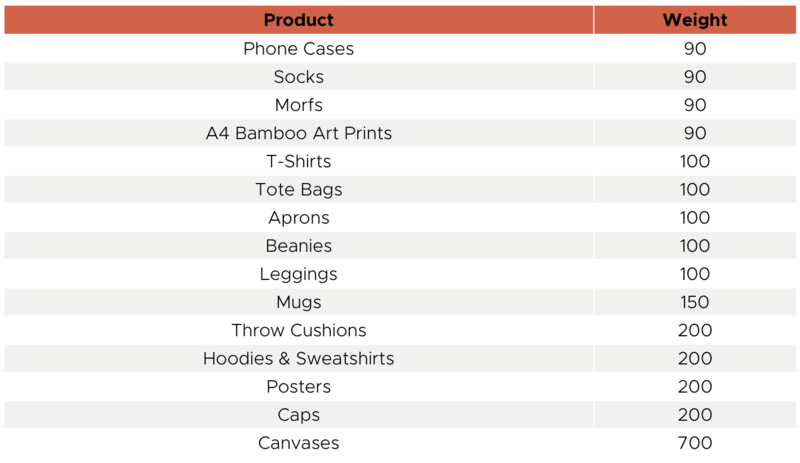 At this stage, it's a good idea to add some products to your basket to see what the shipping rates come to (test different combinations, a single t-shirt should cost £1.57 to the UK but two t-shirts will cost £3.49). If you find that your shipping rates are totalling more than they should despite following this guide it's likely Shopify has created a default Package Size that's pushing your shipping rates up a bracket. It's very easy to resolve though. Head to your Shopify admin panel, then click Settings > Shipping and scroll down to Packages. This is where you'd assign extra shipping costs based on weight and package size, but packing costs are included in our shipping rates. This means if you have a package set up here it'll only serve to add more weight to a parcel that doesn't need it, pushing your order shipping up to a higher weight bracket. Edit anything listed to have a weight of 0.0g. After this step, your shipping rates should perfectly match ours (if they didn't already). Congrats! That's everything. Your store will now charge your customer shipping in the same way that Inkthreadable charge you for shipping their orders.